First, let me acknowledge what may be obvious to many readers: chocolate, fudge, and brownies are not part of ancient Ayurvedic cuisine. Nonetheless, I believe in adding some flexibility to my offerings so that people exploring Ayurveda don’t feel constrained by too much austerity. As one of my Ayurvedic mentors often says, it’s what we eat day in and day out that has the greatest impact on our health and wellbeing. A little chocolate for Valentine’s Day can be embraced even by yogis and those on a wellness path! Usually, I make these bittersweet goodies with almond and oat flour, coconut sugar, and dark chocolate chips, and this means I can eat one (but just one!) without getting the sugar blues. I prefer my chocolate straight up: no nuts, thank you! For those who feel it’s not a brownie if it doesn’t have nuts, you might want to add 1 cup of chopped pecans or walnuts. Just this week I made these brownies with chestnut flour instead of almond and oat, and because of this, I was able to use 1 cup less sugar. These were definitely bittersweet, and I describe this option below. Chestnut flour is naturally much sweeter than oat so it doesn’t require as much sugar. The down side: it’s not available in many places. You can, however, order it online—a link is below. 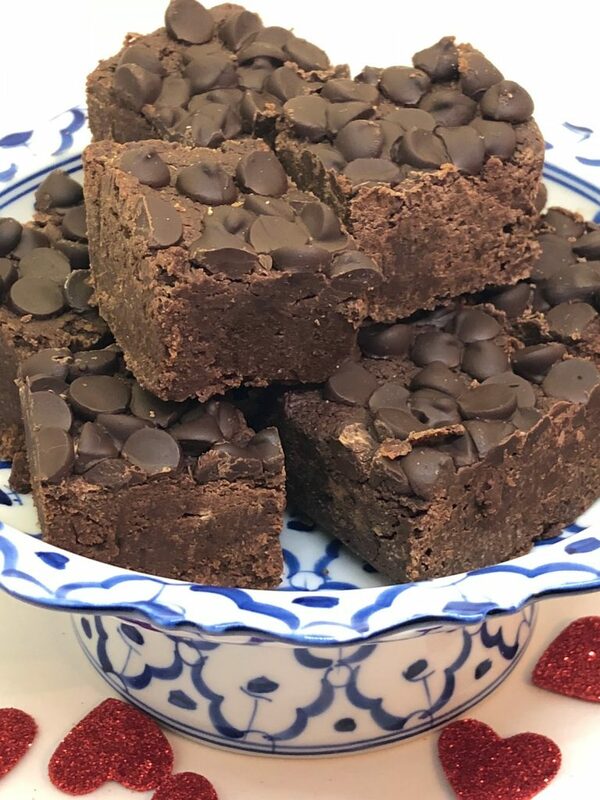 Whether cooking for your sweetheart, friends, or your entire family, enjoy these gluten-free vegan fudge brownies! You can replace the almond and oat flower with 2 cups of chestnut flour. If using chestnut flour, cut the sugar back to 2 cups for bittersweet or to 2½ cups for moderately sweet. For a lower glycemic index, replace 1 cup of the sugar with 1 teaspoon powdered stevia. I prefer the KALbrand. If you like to balance the sugar by using eggs, replace the flax seeds and water with 5 eggs. When I’m not baking vegan, I enjoy replacing the oil with ghee. Measure the coconut oil or ghee while it is solid, packing it into a nesting cup measure. The key to fudgy brownies is to not overcook them and, once they’re out of the oven, to chill the brownies for a few hours before serving.Grease an 8×8 pan and line with a sheet of parchment with the paper going partly up the sides. Grease the parchment and then dust it with a little oat or chestnut flour (or King Arthur Gluten-Free All-Purpose Flour, if you have it). Tap out the excess flour. Grease an 8×8 pan and line with a sheet of parchment with the paper going partly up the sides. Grease the parchment and then dust it with a little oat or chestnut flour (or King Arthur Gluten-Free All-Purpose Flour, if you have it). Tap out the excess flour. Preheat the oven to 350˚F, and position the rack in the lower half of the oven. Melt the fat and chocolate together either in a double boiler or over low heat in a 3-quart saucepan. (If not using a double-boiler, you will need to stir the mixture often to ensure it does not burn.) Once the chocolate mixture is melted, pour it into a large mixing bowl. Stir in the sugar. Let the mixture cool. While the chocolate and fat are melting, prepare the flax “eggs” by mixing the flax meal with water in a cup and refrigerate for 10 minutes or more. Sift the almond flour and measure both flours into a small mixing bowl, whisk in the salt and xanthan gum, and set aside. Once the chocolate mixture has cooled some, whisk in the vanilla and almond milk. Add the flax-egg mixture and whisk well to combine. Add the flour mixture, a bit at a time. Add the nuts, if using. Spread batter evenly in the baking pan. Sprinkle with chocolate chips. Bake 30 to 35 minutes, only until the batter is set and doesn’t jiggle too much. Do not wait until a toothpick comes out clean; if you do, the brownies will be overcooked. Cool on a rack for 30 minutes. Refrigerate for at least 2 hours before cutting. Once the brownies have been chilled, serve and store them at room temperature. Ayurvedic Note: Although I consider this to be a healthier version than some brownie recipes, I still save it for special occasions! Chocolate increases all doshas. Coconut oil increases kapha. Although coconut sugar is a healthier alternative than refined sugar, it still increases kapha and, if not eaten sparingly, can throw blood sugar into imbalance. Dr. Vasant Lad tells students that cardamom is the antidote to chocolate, so I recommend serving brownies with a cup of chai or a simple glass of almond milk laced with cardamon…yum! Those look yummy. I bet Gary would love them for Valentine’s.